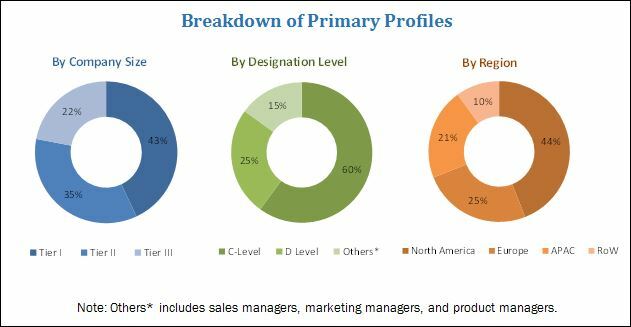 [130 Pages Report] The cloud engineering market size is expected to grow from USD 4.20 Billion in 2016 to USD 13.43 Billion by 2022, at a Compound Annual Growth Rate (CAGR) of 23.2% during the forecast period. With the increasing penetration of cloud computing and related technologies, such as Internet of Things (IoT), and edge computing and serverless architecture, the demand for cloud engineering services among enterprises is gaining huge traction. The base year considered for this study is 2016 and the forecast period is 2017–2022. The cloud engineering ecosystem comprises service providers, such as Sogeti (France, Europe), Aricent Inc. (California, US), Trianz (California, US), GFT Technologies SE (Germany, Europe), Engineering Ingegneria Informatica SpA (Rome, Europe), Rapidvalue Solutions Inc. (California, US), ITC Infotech (Karnataka, India), Nitor Infotech (Maharashtra, India), Softcrylic LLC (Minnesota, US), Calsoft Inc. (California, US), Searce Inc. (Texas, US), and VVDN Technologies (Haryana, India). The other stakeholders of the cloud engineering market include systems integrators, application designers and development service providers, and network service providers. These Cloud Engineering Services Vendors are rated and listed by us on the basis of product quality, reliability, and their business strategy. Please visit 360Quadrants to see the vendor listing of Cloud Engineering Services. Detailed analysis and profiling of additional cloud engineering market players (up to 5). The cloud engineering market is expected to grow from USD 4.73 Billion in 2017 to USD 13.43 Billion by 2022, at a Compound Annual Growth Rate (CAGR) of 23.2% during the forecast period. The demand for cloud computing is driven by many factors, such as lower costs, flexibility, agility, and security. Engineering combines the know-hows of research and innovation with the lifecycle of cloud-ready products to offer state-of-the-art Infrastructure-as-a-Service (IaaS), Platform-as-a-Service (PaaS), and Software-as-a-Service SaaS service, and reduce the Time-to-Market (TTM). The cloud engineering market has been segmented on the basis of service types, service models, organization sizes, deployment models, verticals, and regions. The cloud storage service type is expected to grow at the highest CAGR during the forecast period, and the consulting and design service segment is estimated to have the largest market size in 2017 in the cloud engineering market. Engineering in the cloud uses an approach that addresses the entire lifecycle of application programs, design, development, testing, and development operation phases. Adoption of cloud services among the Small and Medium-Sized Enterprises (SMEs) segment have become a central part of the business processes, due to the ease of use and the flexibility they offer, and is expected to grow in the coming years. The public cloud deployment model is estimated to hold the largest market share in 2017. By using cloud engineering, enterprises are developing new and better ways to enhance operational benefits, while reducing costs. Lower costs and greater efficiency than on-premises and growing adoption of serverless computing are driving the demand for the cloud engineering services. The enterprises, which are adopting cloud engineering, are increasingly inclined toward deploying cloud-based services to run their critical business functions. 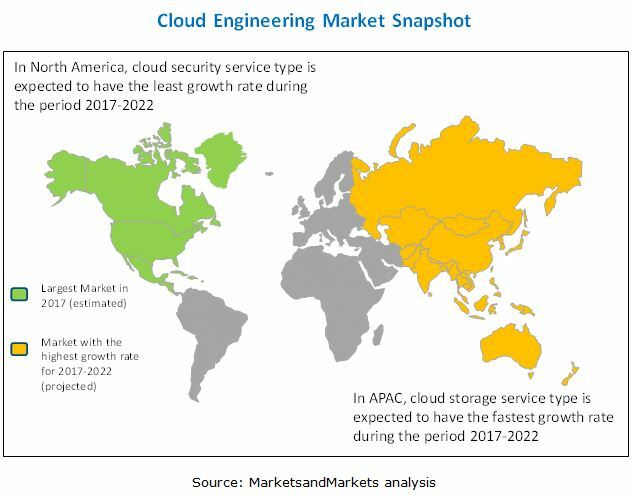 North America is estimated to have the largest market share in 2017, whereas the Asia Pacific (APAC) region is projected to grow at the highest CAGR during the forecast period in the cloud engineering market. An increasing need for efficient computing framework and shifting of workload to cloud environment are driving the demand for the market, globally. Adoption of cloud engineering is increasing in the market, owing to the growing adoption of cloud-based services and the emergence of Internet of Things (IoT). However, enterprises face some obstacles while adopting cloud engineering, such as the fear to lose control of data and protection of Intellectual Property Rights (IPR), and rising concerns for regulatory compliances. The major vendors providing cloud engineering services are Sogeti (France, Europe), Aricent Inc. (California, US), Trianz (California, US), GFT Technologies SE (Germany, Europe), ITC Infotech India Ltd. (Karnataka, India), Engineering Ingegneria Informatica SpA (Rome, Europe), RapidValue Solutions Inc. (California, US), Nitor Infotech (Maharashtra, India), Softcrylic LLC (Minnesota, US), Calsoft Inc. (California, US), Searce Inc. (Texas, US), and VVDN Technologies (Haryana, India). These players have adopted various strategies, such as new product developments, mergers and acquisitions, collaborations, and partnerships, to expand their presence in the global cloud engineering market.